Sir Hugh Myddelton. 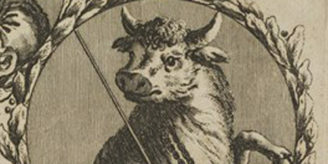 Line engraving by A. Walker, 1751, after C. Johnson, 1632. With the current resurgence of interest in London’s lost rivers, there’s a case to be made that perhaps the capital’s most unknown waterway is actually hidden in plain sight. Whilst your Fleets, Tyburns and Effras have the occluded air of mystery that come from being located under the city’s streets, the New River, out in the open air of North London suburbia, often seems an under-appreciated body of water. Maybe not a truly lost river then – but certainly one that plenty of Londoners have yet to find. Its salient detail is that it isn’t a river at all – actually a man-made waterway, built between 1609 and 1613, with the aim of bringing fresh water to London from springs in Hertfordshire. It opened 400 years ago this month and to mark the date, we thought a stroll along its banks with the aid of our collections was in order. Primarily, the New River was a triumph of 17th century enginnering and commerce. One of the main instigators of the project is shown here. 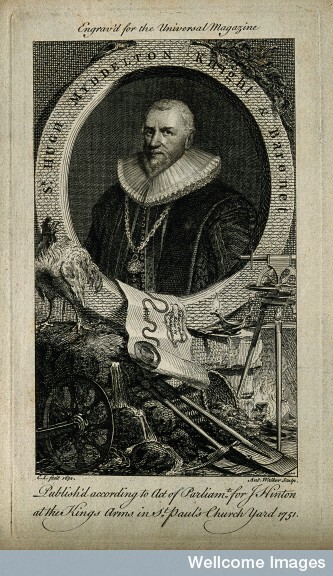 Whilst not the originator of the idea of bringing water to London in this fashion, Sir Hugh Myddleton took charge of the project in 1609 and led its construction (the money raised in part, through a loan from James I). This engraving includes the surveying and mining tools needed to plan the New River’s course and to cut its path through the fields north of London. This was no easy feat: relying on gravity alone, for the system to work the contours of the land had to be carefully followed, with the waterway dropping around just fiver inches per mile on its way towards London. The water drawn into by the New River reached a waterworks near Islington Hill. From there, wooden pipes brought water to businesses and households who had reached agreement with the New River Company. 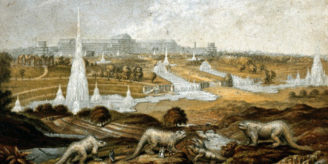 The earliest representation we hold of the New River is by Wenceslaus Hollar – one of a number of drawings Hollar made for the Company in 1665 (Hollar’s earlier panorama of London, The Long View of London from Bankside being one of the most famous representations of London in the 17th century). The image shows the outer pond of the waterworks at New River Head. It received surplus water from the main reservoir, known as the Inner Pond, which is within the circular brick wall on the right. 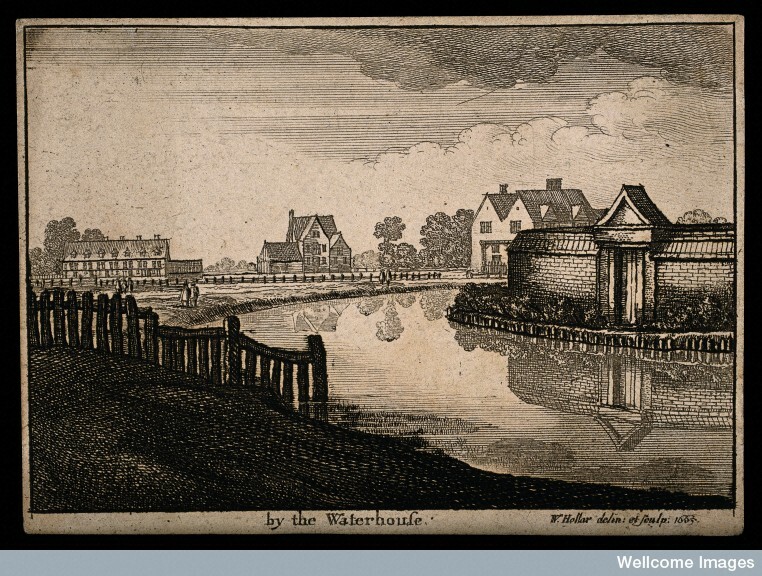 The Waterhouse of the caption abuts the Inner Pond. 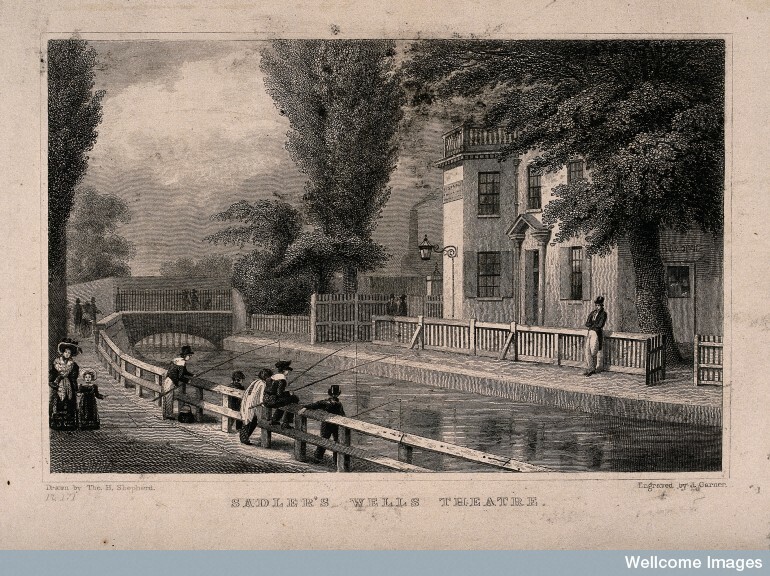 Most of the scenes we hold of the New River, feature Sadler’s Wells. 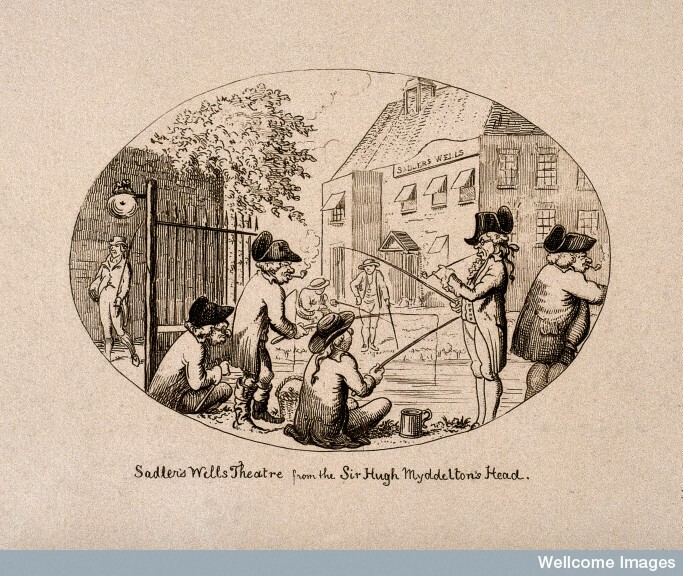 Famous now as a venue for contemporary dance, the Wells in question were discovered in the mid-17th century and were quickly promoted for their healing qualities. By 1683, a garden and concert-hall had been created around the Wells and the area quickly established itself as an area of entertainment. By the early 19th century, the nearby New River formed a key part of the Sadler’s Wells theatre: a water tank under the stage – filled from water piped in from the River – was used to stage aquatic plays (including a re-enactment of the Battle of Trafalgar). These scenes of bucolic gentility often feature the New River as a location for fishing. However, the New River Company often raised objects to what they saw as an illegal activity, viewing fishing in a similar light to those who bathed, swam and even polluted the waterway. One individual who discovered venturing into the New River caused its own problems was Samuel Taylor Coleridge: after swimming in the River and staying in his wet clothes for the rest of the day, the poet endured a lengthy bout of rheumatic fever. However, the waters of the New River did also inspire benevolence in the form of the country’s oldest lifesaving society. 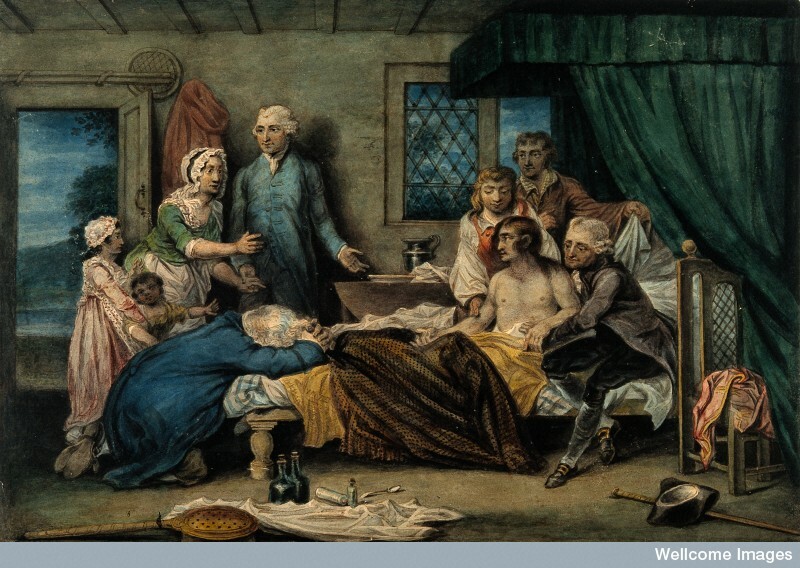 In this idealised image, the figure holding the recovering patient has been identified as Dr William Hawes. Hawes was the son of an inn-keeper, whose father’s inn stood on the banks of the New River at what is now Essex Road in Islington. Hawes claimed that it was the sight as a child of seeing so many dead bodies being retrieved from the New River that was the inspiration for his later interest in resuscitation of the apparently drowned. The Royal Humane Society – co-founded by Hawes in 1774 to aid resuscitation– would later provide rescue equipment alongside river banks, including some along the New River. Our last image takes us into the mid-19th century. The New River Company had attempted to keep apace with the growth of London: competing with new water companies to supply the capital’s rapidly growing populace. 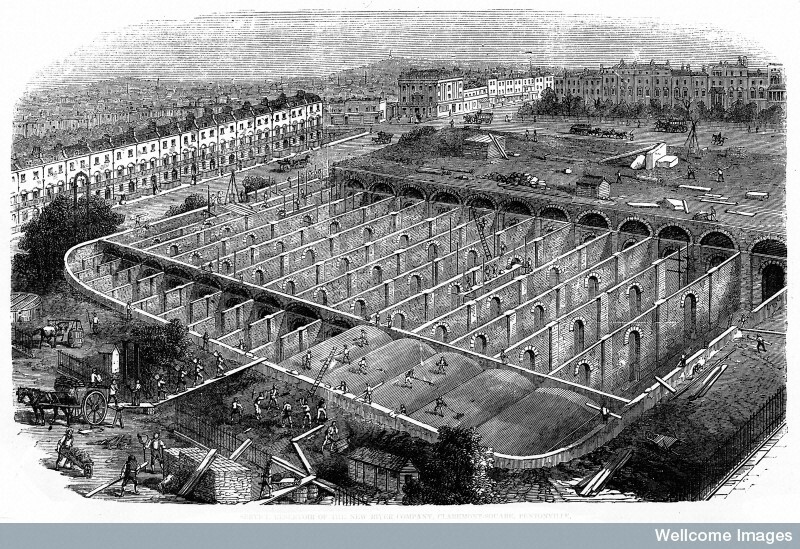 However, the Metropolis Water Act of 1852 – brought in after the city’s cholera epidemic of 1846 – required all reservoirs within London to be covered. 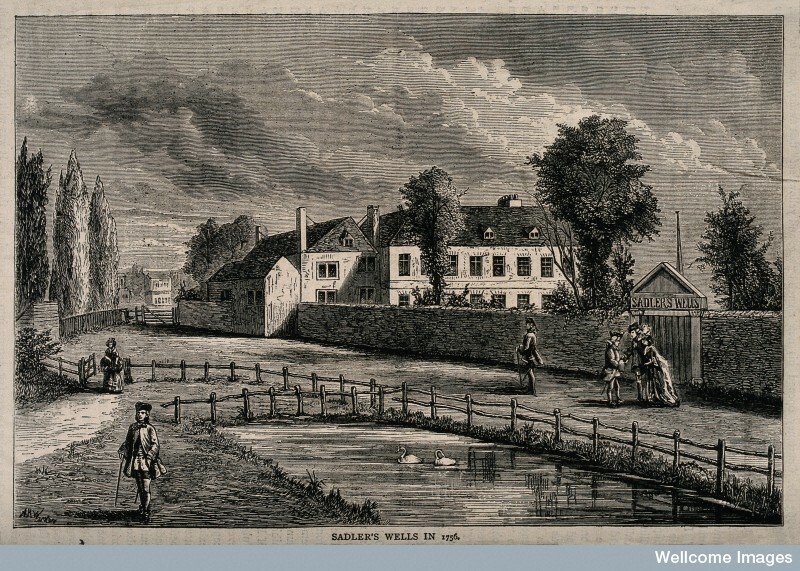 This led to a massive redisign of the New River’s Upper Pond in Islington, built in 1709 (close to the area drawn by Hollar in 1665) as an open reservoir. This space – now under the control of Thames Water – still helps to supply London with fresh water. The structure – hidden behind railings and trees – lies within what is now the residential area of Claremont Square, N1. The New River, designed to bring fresh water to London, trickles into a series of other seemingly unrelated tributaries, such as Early Modern engineering, entertainment history and the development of resusciation techniques. If this virtual stroll along its banks has caught your attention, we can recommend Robert Ward’s book London’s New River (Historical Publications, 2003) for further details. And if you wish to explore the New River itself, a summary of the events this month to celebrate its 400th anniversary is available from Londonist.